Leaves shook on the branches, causing hushed whispers to suddenly sound all at once overhead. A leaf, slightly curled up and crisp from age and the pendulum swings between the warmth of an Indian Summer and a foretaste of the frigid chill of Winter, fell slowly. It wandered in mid-air, almost hesitant and cautious of its fall. For a few moments, the breeze carried it. On invisible wings, the leaf blew sideways and almost brushed against me. Then it spiralled, turning and twirling like a ballerina, before it softly landed and became lost among its other fallen brothers and sisters. Falling leaves almost always return to their roots. 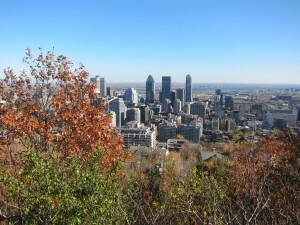 I hiked up Mont Royal, the city’s namesake which lies just behind McGill’s law faculty. The mountain is like an extension of the downtown campus, and it is a place I pay a visit when I need inspiration or a quick breather after lunch. 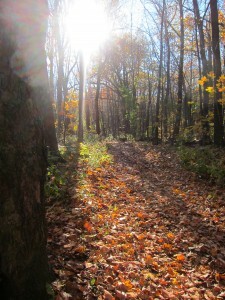 Walking on the maze of paths and trails of the mountain is something I thoroughly enjoy doing at any time of the year. Winter strips everything bare, and then blankets everything with a soft coat of white or heavy layer of ice. Spring creeps in with the return of chirping birds, and as the mercury inches higher, the leaves and flowers begin to bud. 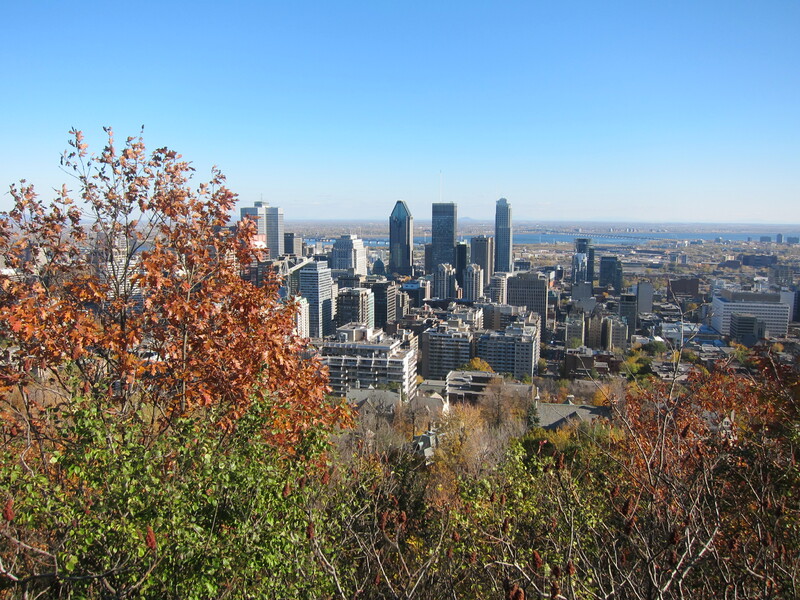 In Summer, with the intense heat, Montreal swelters under horde of tourists and cultural activities, but under the umbrella of lush green leaves on the mountain it always seems to feel refreshingly cool. And then there is Autumn. That schizophrenic in-between season when it’s not too cold, not too warm, when the weather is as indecisive I am when it comes to what I should wear every time I go out. It is the season when nature unleashes its true colours, splashes them on the trees for a few weeks in an elaborate display before sudden storms sweep all the leaves away. It is a season when we can see nature at work as an artist who does not shy away from contrasts and every available colours on her palette. 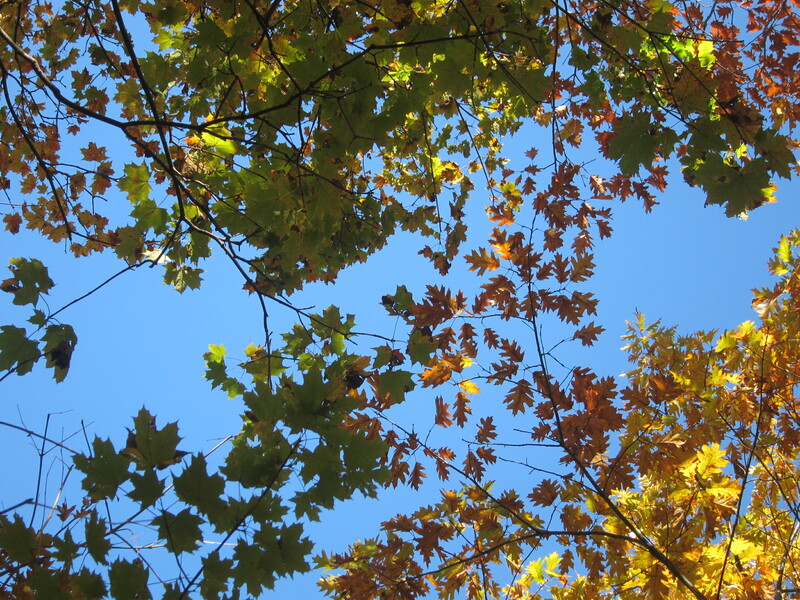 Under a clear, clear blue sky, through the laziness of the Autumn sun that penetrated foliage, colours of various shades, hues and tones came to light. Some trees were topped with bronze, others crowned with red, gold or yellow. Some trees captured that gradual change of colours, as from the bottom to the top of the tree the leaves were dyed in variations of green, yellow and orange. Other trees were already stark naked, standing there looking embarrassed in comparison with their more elaborately dressed neighbours. Gentle rustling sounds on the bed of fallen leaves alerted me of cute little squirrels. With their bushy tails and little front paws, they scurried around in search of food and in preparation for the harsher weather to come. 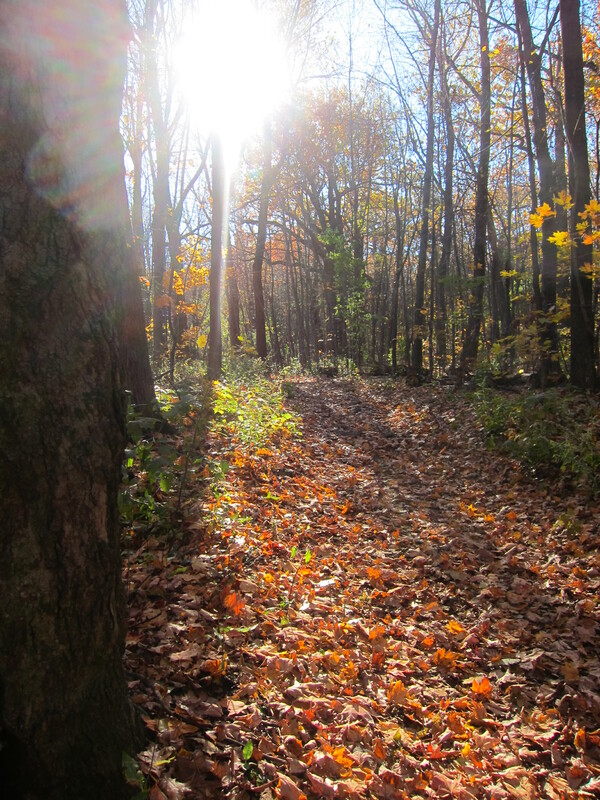 I wandered through the forest, treading ever so light and softly, yet with every step I could hear the soft cry of leaves crunching beneath my feet. Most leaves still clung on, many fluttering like the wings of ten thousand butterflies on the tops of trees whenever the wind blows. Others easily let go, succumbing to the inescapable reality that everything changes, and nothing ever stays the same. Those leaves which let the elements take its natural course and let go, fall with the grace and aid of the wind and attraction of the Earth. Those which cling on must continue to bear the brunt of the wind, and witness the fall and loss of their kins. It will only be a matter of time, perhaps days, perhaps another week or two, before the fate of falling catches up with all the leaves. By then, the mountain from afar will have put on another coat of another texture and colour in preparation for another season. Previous Post And I have no compass, and I have no map. And I have no reasons, no reasons to get back.